The Eyes are the window to the soul and God is the creator of the soul, if you are a believer of such. Imagine being able to prove that God doesn't exist by proving that eyes and the ability to see are a result of evolution and that genetic manipulations can be made by man, who essentially is playing God. Two researchers are on the hunt for the missing living link that cannot see but holds the gene for eyesight. Essentially they seek the creature that is blind but could be made to see via genetic manipulation. Now imagine that your discovery is the key to the potential proof of another religious belief, one that was unexpected but every bit as profound and life changing. I Origins, an independent film directed by Mike Cahill premiered at Sundance in 2014, winning the Alfred P Sloan award for films utilizing science and technology elements. It tells the story of PhD molecular biologist researcher Ian Gray (Michael Pitt), who has always had a fascination for the fingerprint of the eye, He has documented eyes in excess via photography and maintains a huge data base. At a Halloween Party he meets, eyes first, the ethereal and mysterious Sofi (Astrid Berges-Frisbey), who happens to have very unique and dazzling eyes. On screen, Astrid has the ability to appear different in different settings and evoke different emotions based on her portrayal at the time. Mr. Pitt's performance shows a man who is all about scientific elemental control and manipulations yet is getting sucked deeper and deeper into the eyes, world and experiences of an enigma and it is soon clear that he doesn't want to find his way back to the rules and guidelines of a lab. He is compelled, after a sort but intense encounter, to find her after she disappears. A series of coincidental numerical clues leads him to the resource he needs to find her. Fated soul mate? Muse? He is enamored and soon they both begin a passionate yet " far out of his comfort zone" affair. They are eventually consumed mind, body and soul and Ian explores aspects of himself that his intellectual didn't quite allow to develop. Ian's research takes on new intensity with the addition of freshman researcher Karen (Brit Marling) whose ambitions prove to be the driving force towards discovering the link and key between the sighted and the sightless. As with most intellectuals, Ian and Karen doubt the existence of God and feel this discovery could disprove His existence. I Origns is full of intellectual dialog and profound 'what ifs' that may fly over the head of the typical film goer. It should be considered a cerebral film and not a light hearted sci fi outing. There are several unexpected plot twists key to the story's development that should not be given away but the dilemma and question at hand centers on the unique fingerprint of the eye, which like snowflakes and our own fingerprints are unique and only occur once in nature. Or so we think. If it is discovered that two people can have the same eye color patterns but not co-exist, what does that mean within the spiritual world? If the eye indeed the window to the soul then how are souls connected that belong to people with the same eye print? This film is deeply spiritual and philosophical while exploring the realms of love, the soul, science and a higher power. It also tends to get a big messy and convoluted in its apparent mission. If we are not careful, we the audience can get a bit bogged down with all the weightiness. Ian's son, born several years in the future, is found to be a connecting factor to potential new discoveries in a world that uses eye print identification technology. A complicated investigation into a mystery ensues. Within the film itself, well integrated cinematography and an enhancing score tie together the story elements. As Sofi shared, "If a blind worm cannot see light, that does not mean that the light is not there. If the human cannot see God, that should not mean that God is not there." If humans attempt to play God that does not mean that they are. But which of the world's religions truly has it right? 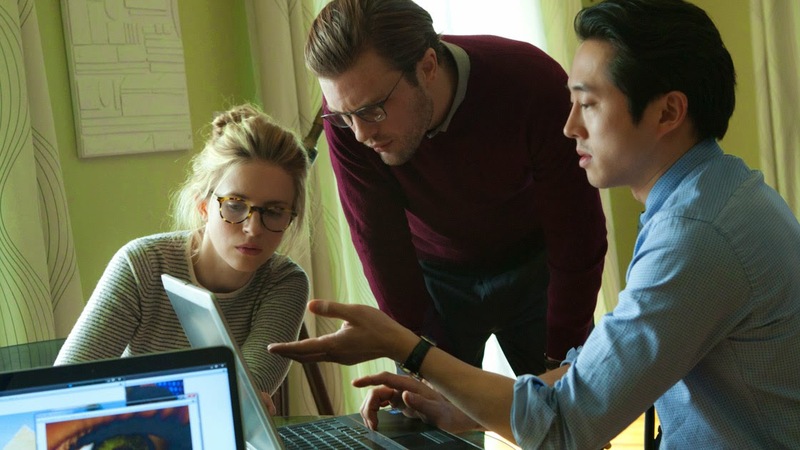 I Origins attempts to make us think more deeply and contemplate some of life's more profound mysteries. Some movie goers are simply not going to want to think quite so hard on their dates or fun nights out escaping the pressure of the work week.